Confess. Do you believe that elegance is underrated? Are those your eyes lighting up when the good china, silver, and crystal come out? When the candles are lit and every fork knows its place? Then one of our Regal styles may perfectly suit your fancy for formal dining with handcrafted furniture. 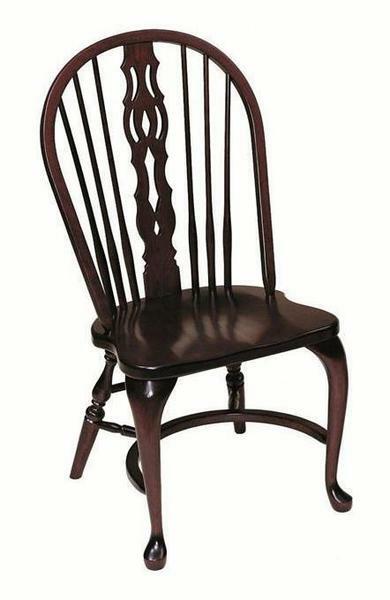 Although Britain's Queen Anne reigned from only 1702-1714, the handmade furniture style named after her was popular through the mid-18th Century in colonial America. It was an elegant, graceful refinement of its heavier predecessor. Our Keystone Queen Anne and Keystone Regal Amish furniture lines are marked by cabriole legs, fiddle-back chairs, delectable curves, and sculpted edges. Our Queen Anne and Regal Amish Furniture are stunning in dark cherry. The most elegant handcrafted furniture we offer. Regent . . . the classic expression of formality captures a timeless, elegant grace. The absence of straight lines clamors for attention. Consider the arcs of the spindled chair back and spreader. The elaborate fiddle-back and the cabriole legs. The dual pedestal table acknowledges the curves that unify it all. If Elm/Clear Maple – S wood option selected, elm will appear on chair seat and upper back (or bow) only. Exclusive and innovative joinery technique paying special attention to the wedged tenon. This helps the joints to remain tight for a life-time or more. Replaces our dining room table. Outstanding quality. Recommend to any home owner.